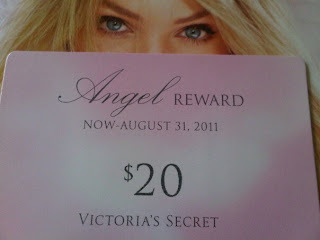 When you own a Victoria Secret card, consider yourself as an Angel :-). Two years ago, while I was processing my Immigration Documents in Louisiana, an employee of Victoria Secret approached me and invited me to apply a VS card. I got the card and the privilege of having an Angel card is truly remarkable! The freebies are endless. VS also give-away free samples of their newest design on lingerie products and every birthdays, Angels have a surprise gift from Victoria Secret too. Freebies are real good, huh! Akoa nana beh hehe..anyway long time no visit man ko diria oi dugay na au.musta nmn ka girl? juntis na? ?